The hay moisture meter PCE-HMM is a professional device to designed to determine moisture and temperature of pressed hay and straw. 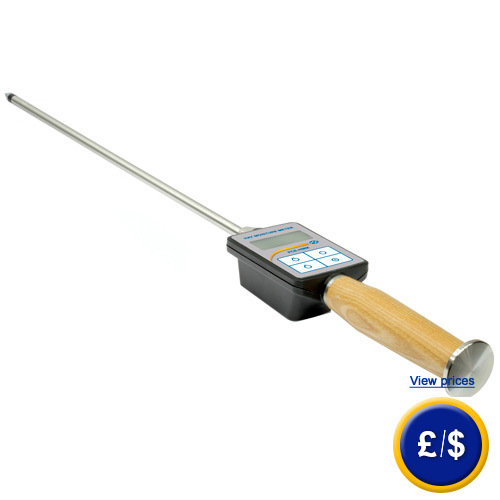 The hay moisture meter features a sensor made of stainless steel, which can be purchased in four different lengths, while the wooden handle has an ergonomic design. The hay moisture meter PCE-HMM proves to be extremely robust, designed to withstand applications for many years. The measuring range of the hay moisture meter covers 9 ... 50% and a temperature range of -10 ... +100 °C. The LCD display of the hay moisture meter shows continuously the current moisture, so the hay moisture meter can be applied at varying locations and on different bales without the need of performing any manual operation by pressing any keys to start the measurement. Thus the hay moisture meter facilitates assuring the quality of fodder even during harvesting in order to prevent any damage by fungal infestation. If there are any questions about this Hay Moisture Meter PCE-HMM, please have a look at the technical specification below or call: UK customers +44(0) 23 809 870 30 / US customers +1-410-387-7703. Our technicians and engineers will gladly advise you regarding all moisture meters and all products in the field of measuring instruments, regulation and control and scales. - Assures fodder quality and prevents damages due to fungal infestation.